We supply world class made plasticware. 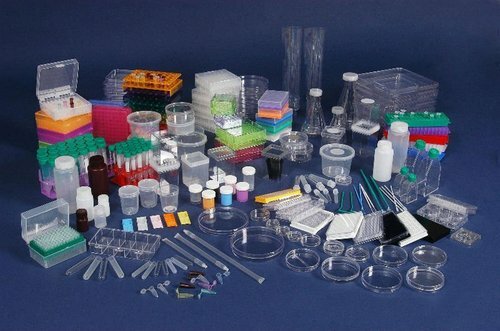 The range of Laboratory plasticware, offered by us, includes Laboratory Trays, Desiccator, Laboratory Stands, Laboratory Tubes, Laboratory Baskets, Laboratory Beakers & Cylinders, Laboratory Boxes, Laboratory Containers, Laboratory Flasks, Laboratory Funnels, Laboratory Jars, Laboratory Racks, Laboratory Bottles, Retort Stand, Pipette Stand, slides boxes, Vials, Stool & Urine containers, collin jar, etc. These sets consist of moulded balls of different colours and sizes along with connecting lugs of different sizes. These sets are very helpful in modelling different organic & Inorganic compounds. SENIOR SET : This set consists of 185 lugs & 370 balls of prescribed colours & sizes packed in a moulded box having separate space for every particular colour & size of ball. JUNIOR SET : This set consists of 37 connecting lugs & 75 balls of different colours & sizes packed in a moulded box. We are supplier of A-calss fast release pipetting device for precise pipetting & zip quick emptying. The knurled thumbwheel can be rotated to draw up or dispense liquids while the releaser may be pushed in for zip-quick emptying. The moulded chuck has silicon rubber collet inside to hold various pipettes of standard sizes. It resists acids & alkalies and can be easily disassembled for thorough cleaning. Pippete filler : it comprises of a bulb with three pinch valves that controls the influx and efflux of pippete contents. These wide mouth reagent bottles are available in Polypropylene as well as Polyethylene. The PP bottles as rigid, translucent and have excellent contact clarity. These bottles can be autoclaved.